A new report on the United States’ clean energy industry is calling on President Obama and Congress to ramp up efforts to make sure the country does not fall behind in the emerging renewable energy revolution. The Pew Charitable Trust lobbying group says it is time for a national standard to replace the current state-by-state arrangements. Clean energy supply should at least double its current level, tax credits and incentives should be renewed and enacted for clean energy initiatives, and policies that level the playing field of renewables vs. fossil fuels should be introduced. The report predicts that between 2012 and 2018, cumulative revenue generated from solar power around the world will reach $1 trillion. Annual global solar revenue is expected to rise to $183 billion in five years, with PV installations totaling 375 gigawatts in 2018. Annual global solar revenue is expected to reach $183 billion in five years, and PV installations will reach 375 gigawatts in 2018. With these numbers in mind, Pew sees the role of the U.S. declining in solar energy’s future, especially with countries like Germany and Italy installing more than three times as much power, even despite installed capacity in the U.S. doubling in the last two years. It also noted that the U.S. is one of very few countries with no national renewable generation target, one thing that is a crucial part of any country’s clean energy agenda. So far, there are only four fixed energy tax credits, three for oil and gas, and one for nuclear. 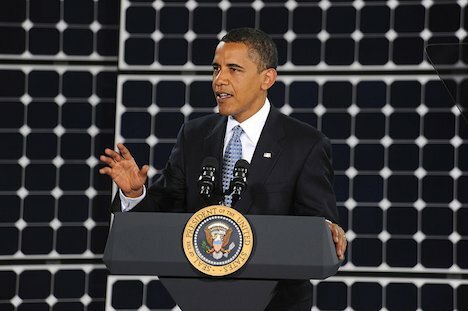 Obama has made a significant mention of both climate change action and clean energy recently. Do you think all of this is the beginning of some serious progression, or are you skeptical that it’s still just a bunch of talk?